Lasers have been used in aesthetic medicine for decades with continued advancement in technology and new indications for treatment. We have recently seen some changes here in WA in regards to our previously very strict laser laws and regulations which previously only allowed medical doctors to operate medical grade lasers (we refer to these as class 4 lasers). Now that the laws have become a bit more lax many may notice new laser clinics popping up everywhere. What better opportunity to take some time to educate you all on lasers and why not every laser is equal. Lasers can treat an extensive number of skin conditions; from skin rejuvenation, skin resurfacing, wrinkle reduction, pigmentation, vascular conditions, tattoo removal, hair reduction, acne scars, surgical scars, feminine rejuvenation and more. Because lasers are so versatile and vary in so many ways on how they affect the skin it can be hard to know where to begin when researching a treatment. A simple google search can be confusing and navigating through marketing buzzwords only adds to misinformation. Let’s start right at the beginning as understanding a bit more about what a laser acutally is, helps you understand why it is used for medical treatments. The term ‘Laser’ is an acronym for Light Amplification by Stimulated Emission of Radiation. Monochromatic - it is only a single wavelength and one colour. Coherent - the laser beam is always in the same phase. Collimated - the laser beams travel in parallel paths to each other. Lasers work to deliver light into the skin which is then attracted to a certain chromophore. A chromophore is a characteristic of the skin such as melanin (dark pigment), haemoglobin (redness in blood vessels) and water. The laser energy of a certain wavelength is then delivered to this structure selectively and precisely, minimising any damage to the surrounding tissue and structures. When the light is delivered to the certain chromophore it destroys it, something we call ‘selective photothermolysis’. So in the simplest of terms, a laser treats the skin by removing the particular target. It is the wavelength of the laser and the chromophore that the wavelength is attracted to that determines what skin conditions that particular laser treats. More on that later. What Is The Difference Between Laser and IPL/BBL? We are often asked this question here at Youth Lab. Although both lasers and IPL/BBL are light and energy based devices they differ in key characteristics. No this article is not aimed at exploring or comparing the difference between lasers and IPL/BBL, but we are of course happy to explore this in future posts. IPL or intense pulsed light, and BBL or broad band light, both release a broad spectrum of light and are non monochromatic like a laser. IPL/BBL systems have a broad range of light/colour which is generally between 400-1200nm in the one device. You can read more about the differencee between IPL and BBL in our article here, but for the purpose of explaining the difference in technology from laser the systems are very similar in their underlying physics. Both IPL and BBL systems then have specialised cut off filters which can narrow the wavelength which can then be used to treat a certain target in the skin, much like a laser. 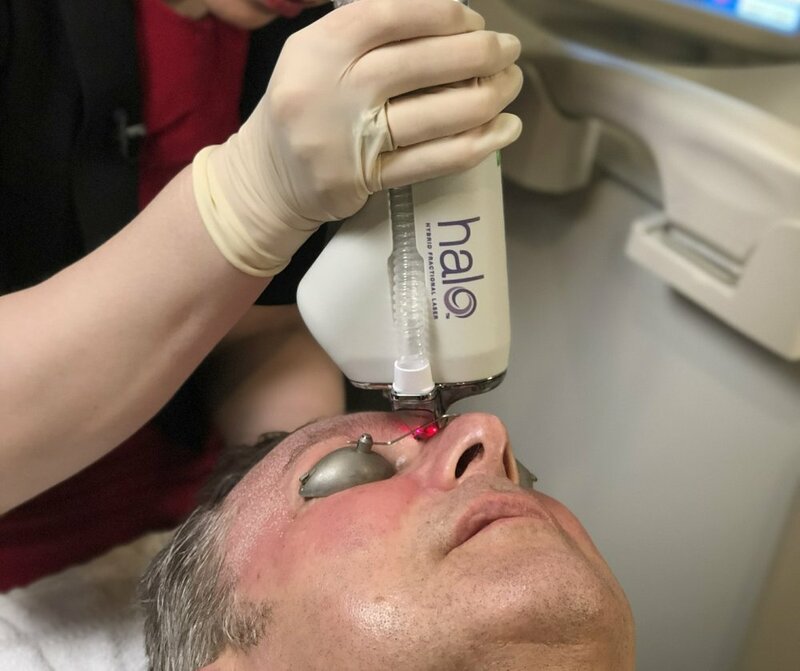 When used correctly, such as with a high quality machine such as the Sciton BBL, these cut off filters can deliver phenomenal results and deliver targeted light to the skin. However when used incorrectly or if the system is not build to a high enough standard, IPL can be unpredictable and expose the skin to unnecessary wavelengths of light which can increase the risk of complications. IPL and BBL are also also not collimated like a laser, meaning the light diverges out and spreads. Again the use of IPL and BBL cut off filters and applicators can help to narrow the band of light to target selective structures in the skin. Due to this lasers can be tailored to selectively treat isolated skin conditions and have the advantage of being very accurate. However IPL and BBL have the advantage of being able to treat many conditions at once for example pigment and redness in one treatment by using appropriate cut off filters. What then sets the Sciton BBL apart from other IPL systems is its ability to further narrow these wavelengths of light, using more cut off filters to selectively target certain colours in the skin with more accuracy. Chromophores are the selective target in the skin that a laser wavelength is targeted too. As we mentioned previously these are melanin, haemoglobin and water. The chromophore is determined by the wavelength and generally one wavelength will only target one chromophore over others. Interestingly, different depths of the chromophore can also determine what laser wavelength is best to target it. This is where it can get complicated and why the knowledge of the laser practitioner is of paramount importance. Laser physics is tricky business. Melanin (the coloured pigment in skin) is absorbed between wavelengths of 500nm to 1064nm but the depth depends on the location of the pigmentation. Pigment can be deep in the dermis like hormonal melasma, or superficial in the epidermis like in sun damaged skin; or a bit of both. Melanin is also found within hair follicles which is deep in the skin, therefore hair removal lasers need to go deep with a longer wavelength. Haemoglobin is found within blood vessels and gives the blood its red colour. Lasers that target haemoglobin are used to treat capillaries, flushing, broken blood vessels, rosacea and red scars. Haemoglobin is best absorbed at a shorter wavelength, but again different depths are often needed as some blood vessels lay deeper than others for example. Water is best absorbed by longer wavelengths but sits at all levels in the skin (afterall over 80% of our skin is water). Water is the target of ‘ablative’ lasers, that is those lasers that work to resurface the skin and treat conditions such as scarring, wrinkles and texture. Long wavelength lasers can be controlled to penetrate to different depths for different result while still targeting water. We will not be getting into tattoo removal in this post but the pigment in tattoos also work as chromophores. Red ink, blue ink, green ink etc are all targets of certain laser wavelengths. The difference with tattoo removal is that the lasers must be very powerful and emit very short pulses of energy to mechanically break up the tattoo pigments, rather than remove them by heat. Tattoo removal lasers are often Q switched or Pico/nanosecond (which you may see in advertising). What Are The Types Of Laser? Now for the confusing (and fun part). It is important to remember that due to lasers being a single wavelength they are best suited to treating different conditions. One laser is not the be all and end all - we need to consider what we need to treat. Here is a list of some of the common types of lasers used in aesthetics. KTP (Potassium titanyl phosphate) 532nm. This laser is a solid state laser using a KTP crystal. It is often combined with an Nd:YAG laser medium. The light generated by these lasers is green and it is absorbed by both melanin and haemoglobin. These lasers are useful in treating both pigmentation and vascular problems such as capillaries and rosacea. Pulsed Dye Lasers (PDL) have wavelengths of 577 to 585nm. The light generated by these lasers is yellow and they are best used to target haemoglobin and treat vascular problems. PDL lasers are very effective in deep vascular problems such as birthmarks and deeper veins. Ruby lasers are a wavelength of 694nm. They use a red ruby crystal and the light generated is red. As a result they target blue and black in the skin so are used to treat pigmentation disorders as well as the melanin within the hair shaft. Ruby lasers are most commonly used as hair reduction lasers as well as in tattoo removal (blue and black pigment in tattoos). Alexandrite lasers are a wavelength of 755nm. This laser releases a red light which is most strongly absorbed by melanin. Similar to the Ruby in regards to its use in hair reduction but as the wavelength is longer (755nm versus 694nm) it penetrates deeper into the skin where the hair follicles lay. Diode lasers have a range of wavelengths in the near-infrared range, they release light between 800 and 900nm and also are absorbed by melanin. These lasers are used in hair reduction (again they penetrate deep into the hair follicle) but also some diode lasers are also used at a longer wavelength of 1450nm which then result in more absorption by water in the skin. They can be used to stimulate collagen in these longer wavelengths as part of non-ablative skin rejuvenation. Nd:YAG (neodymium:yttrium aluminium garnet) lasers are some of the most commonly used lasers in aesthetic medicine. They release an infrared beam which is absorbed by melanin, haemoglobin and water however it is mostly strongly absorbed by haemoglobin. These lasers can be very versatile and come in Q switched and PICO forms meaning they can also be used for tattoo removal. They are best suited for vascular conditions as they are more targeted to haemoglobin in the skin compared with other lasers that are better for pigmentation and skin resurfacing/rejuvenation (see erbium and CO2 below). Er:YAG (Erbium:yttrium aluminium garnet) lasers are gas medium lasers releasing a long wavelength of 2940nm. Erbium lasers have the peak absorption for water in the skin. As a result these lasers are referred to ablative lasers as they are used to ablate the skin and remove damaged superficial skin at the surface. They can also penetrate deeper to stimulate collagen formation and are used for skin rejuvenation and resurfacing for wrinkles, scars and textural problems. CO2 (Carbon Dioxide) lasers release an even longer wavelength of mid infrared light at 10600nm. These are powerful lasers used in all aspects of laser medicine and can be used to cut and vapourise the tissue, they are used in surgery to cut the skin as well as deep laser resurfacing. These are some other terms you may hear when lasers are mentioned in advertising. In a nutshell ablative lasers work to remove the top layers of skin (the epidermis), examples of these are the CO2 and Er:YAG lasers. 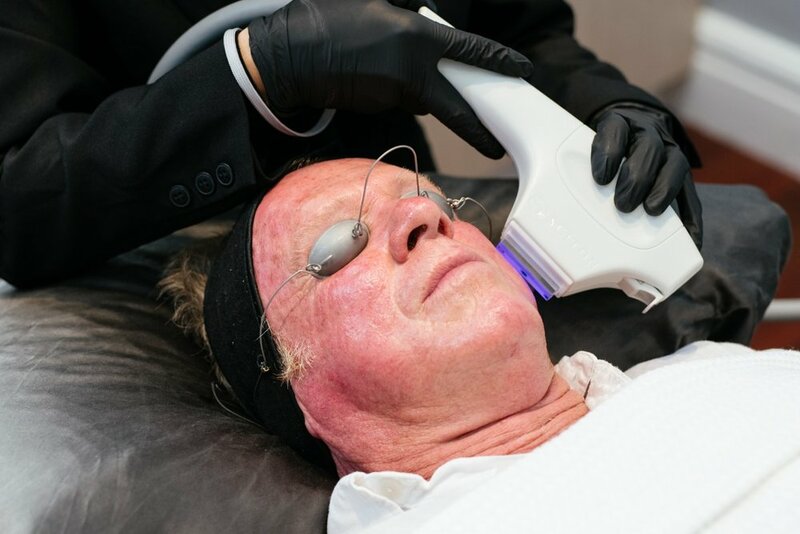 They are resurfacing lasers which treat photodamaged, deep lines and wrinkles, early skin cancers, scarring, textural changes and result in collagen and elastin remodelling. Non-ablative lasers do not remove any skin. They work to heat the skin below, treat particular skin conditions such as vessels and pigment and stimulate collagen production. Non-ablative lasers generally have little to no down time whereas ablative lasers can result in significant downtime depending on the settings used. The risk of complications such as hyperpigmentation and residual redness are higher with ablative lasers but is minimised with correct training, use of correct settings and patient selection. Fraxel is simply a brand of laser. In the same way Nike is a brand of shoe. It was one of the first lasers released which utilised fractionated technology which is why it is so well known. Fractionated lasers use multiple narrow beams of laser light to penetrate the skin while leaving healthy, untreated skin around the channels. By targeting only sections of the skin at a time the down time is less as less tissue is damaged, however results are almost comparable to full field treatments. The most popular Fraxel laser is actually a dual wavelength laser and is non-ablative (using 1927nm and 1550nm). Fraxel also has an ablative CO2 laser. Again, may clients may not actually know what ‘Fraxel’ they are getting. The Fraxel Dual (1927nm and 1550nm) is NON ABLATIVE and the Fraxel Repair (10600nm) is ABLATIVE meaning they are very different treatments with very different outcomes. Now remember not to get caught up in brand names. Many other lasers utilise fractionated technology. Many of the new ablative CO2 and Erbium ablative lasers are fractionated meaning less down time, less risks of complications and comparable results to traditional resurfacing. 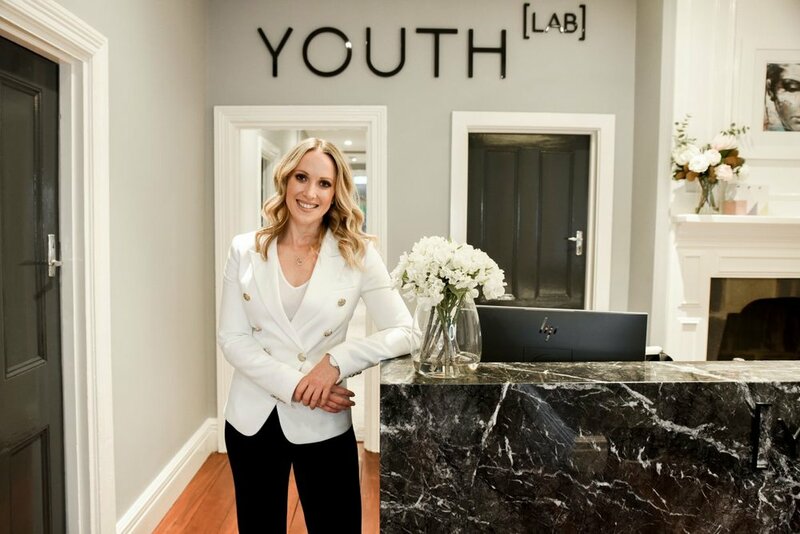 These treatments result in collagen remodelling and stimulation resulting in a reduction in photodamage, wrinkles, pigmentation, textural changes and overall healthy glowing skin. Technology is continually advancing in the field of fractionated lasers. We even have a new DUAL ablative and nonablative laser on the market which delivers both benefits in a single treatment with less downtime. As mentioned earlier the laws in Western Australia have recently changed regarding the use of cosmetic lasers. To have a class 4 laser at a premises there must be a special licence held. A medical practitioner (doctor) is generally the licence holder and must be registered as such with the Australian Health Practitioner Regulation Agency (AHPRA) and must have attended a laser safety course recognised by the Radiological Council of WA. When seeking a clinic for your laser treatments this is the first thing I recommend you check. Is a medical doctor, an enrolled or registered nurse of holds a diploma IV in dermal therapies. Undertaken a minimum of 100 hours of practical training under the IMMEDIATE SUPERVISION of a licence holder eg the clinic doctor. This is usually 50 hours for treating pigment and 50 hours for vascular treatments. Hair removal required 25 hours of practical training. Doctors do not need to do the supervised training as mentioned above. Nurses and dermal therapists are ONLY able to perform superficial treatments of hair removal, vascular (eg redness and superficial vessels on the face) and pigmentation (tattoos can be removed by registered nurses with a minimum of 5 years experience). The use of ablative wavelength lasers eg CO2 or Erbium is not allowed. See the WA fact sheet here. When used correctly in the appropriate medical conditions lasers are very effective, with minimal risks. However they can result in unnecessary complications. The energy released by these devices can be very high and this can be adjusted by the practitioner according to skin type, goals of treatment and desired down time. Many of the risks of laser result from incorrect energy selection and incorrect laser selection for the condition to be treated. Down time from some treatments is expected and like any medical procedure there are always possible risks. By ensuring you see a doctor or clinic that follows the rules of the Radiation Council and invests in training and the highest quality technology then these risks are minimised. My take home message regarding lasers is to not get too caught up in brand names or the laser treatment of the month. An ethical doctor will focus on your skin goals, conditions to be treated and desired downtime. They will then recommend the most appropriate laser for your concerns and refer on if needed. One laser cannot cure everything and is not the be all and end all. We need to consider - what can we treat with this particular laser? This has been intended to provide a breakdown of some of the science behind lasers and provide basic information to what modalities may be available to you. As always I want you to be safe and educated when seeking out cosmetic treatments. Remember quality and training is of utmost importance, do not be driven on price.